What is the Resource Center application? The Resource Center is one of the web applications that is part of Dragon1. It supports creating a internal website to publish documents within for you and stakeholders. 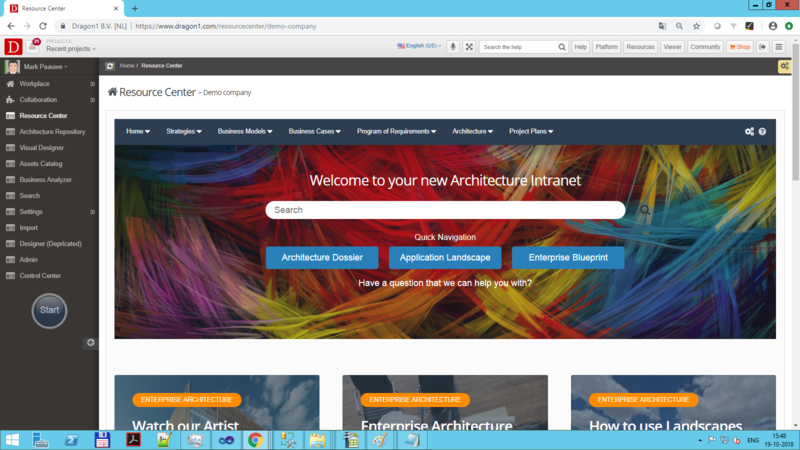 You can use the Resource Center to build an Intranet, Extranet or Semantic Wiki for all the architecture products. The other applications on the Dragon1 platform you can use to create products like documents or content in collaboration. The Resource Center you can use to publish the documents and content. Most often the Resource Center contains something like an Architecture Intranet. Every stakeholder can login and can read, view and watch the strategies, policy documents, reference models, (open) standards, business models, architectures and projects that work with architecture. Below you see an example out of the box version of an Architecture Intranet on Dragon1. The Resource Center plays a vital role in publishing architecture documents that are part of the Enterprise Architecture Dossier. You make it easy for stakeholders to access the documents and also to provide feedback on working with the architecture documents in projects. One of the benefits of using Dragon1 and the Resource Center to communicate the Enterprise Architecture Dossier is that it is no longer dependent on a single person. Organizations that make use of Dragon1 are more likely to improve working with architecture to a next maturity level. Enterprise Content Management (ECM) is about management and storage of documents about the organization and about the processes and other content. The Resource Center enables Enterprise Content Management and Document Management for you. Just like you, we are used working with SharePoint or Alfresco or other CMS and DMS systems. More information about Enterprise Content Management can be found at Wikipedia. Because Dragon1 is cloud-based you can collaborate worldwide with your teams in different locations in different time zones on a single set of data. The Dragon1 Resource Center is often used as a Wiki, Portal or Intranet. You can define any number of main pages and subpages you like and put links to documents on strategies, policies, processes, products, services and projects and anything else on Dragon1. Dragon1 Resource Center can be styled in any color scheme you like to match your corporate standards. Also, the Resource Center can be switched into Wiki mode and Portal mode. In the portal mode, the Resource Center can be used to give access to other applications outside of Dragon1 on your network or intranet via URL-linking. The benefit of doing this is you can work using a single source of truth. No more using different and maybe wrong versions of documents. If there are multiple versions of documents around, just place them together as a different version of a document on a Resource Center page. Dragon1 provides an online help file supporting you in defining and inserting HTML 5 data blocks and Excel/XML-based page information files. Also, some names and data of columns in a spreadsheet-page information file are interpreted like color, width, usernames, content types, categories and tags. See for yourself how brilliant this works! In Dragon1 there is a search module making finding information is easy. Just click search on the top level menu bar and type in what you are looking for. Dragon1 Enterprise Search also searches the content of your Resource Center, so you will never create duplicate content anymore or send emails duplicating files and generating data. 2. Communicate the Enterprise Architecture Process (alignment of the architecture, strategy and project portfolio) across teams and organizations at different locations or timezones. Dragon1 Resource Center is preconfigured for you with editable content. There is a page with strategy documents, policy documents, a way of working with enterprise architecture and other information you might need in an architecture or project team to collaborate. Watch as we go through the default content of Dragon1 Resource Center in this video. 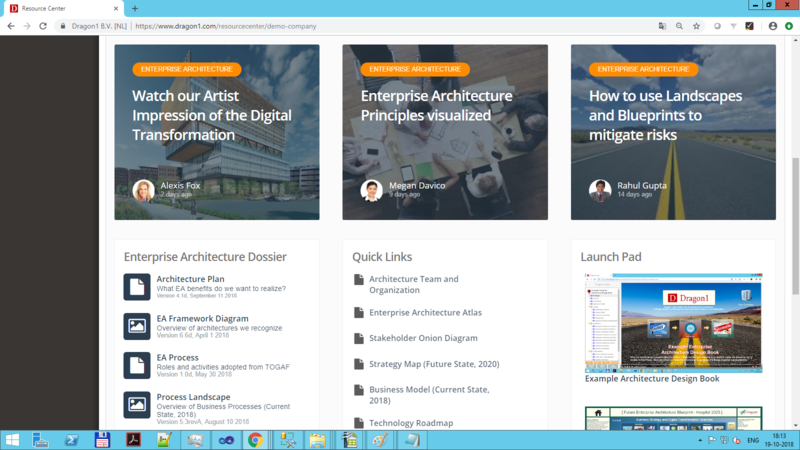 Creating as Enterprise Architect, Manager or CIO your own page in the Resource Center with background information or input for architecture design is easy. 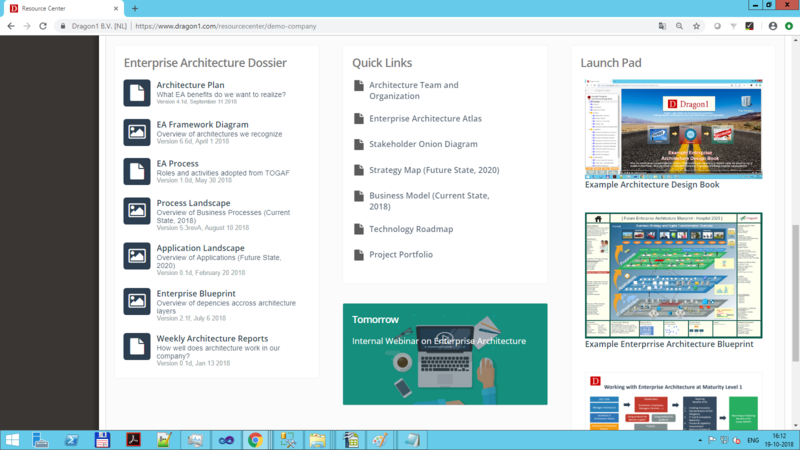 Creating as Enterprise Architect, Manager or CIO your own page in the Resource Center with background information or input for architecture design is easy. Without having to know about HTML you can just type in text and markup text like you are used to in MS Word or another text editor. In Dragon1 Resource Center you can upload files into your own sites folders and link from the pages to these files. Watch the video for a basic example. In Dragon1 data content and data layout can be separated fully. If you want you can mix content and layout of data, but you can also separate them so different people or jobs can collaborate on it. Like its name Dragon1 Resource Center is a center of resources. Every webpage in the Resource Center should give access to a group of users to various versions of certain sources, resourcing them. And of course, mentioning the original location. Let's say you as a manager want enterprise architects to design a system architecture for the new information system for the marketing and sales department. And you want these enterprise architects to have an overview and insights of the companies marketing on a need to know basis. In this case, you create a webpage for marketing resources. Upload the documents and data if necessary to the application in a public or private (not accessible from the internet) folder. If you want you can create a link from the Resource Center webpage to a document or data (SOAP/web service) if it has a local or internet URL (http or file). Create a main page and subpages in the Resource Center and enter layout information for data content blocks. This is in HTML 5 and users can use the HTML Block Insert at the right-hand side for basic html blocks and edit them to your liking. Create per data content block page, information files (in an excel, csv or xml file) that contain the information you want to be shown as text, lists, models, diagrams or graphs on the webpage. Now you are finished with creating your first Resource Center webpage. Suppose over time the content in the marketing documents or data changes, you will only need to update local documents and the page information files and NOT need to change the HTML 5 layout information. If you like you have also via a smartphone access to this information anywhere, anytime, anyplace. You can use your phone's browser to log in and access the Dragon1 Resource Center page. Dragon1 is built with responsive design giving you a web 3.0 experience. With the Resource Center you can collaborate easily when teams are located in different countries and time zones. Per document you can note how the enterprise architects in the application should use it to create architecture products. The enterprise architects or project architects on their part can read and write down here how they actually have used it, updating their own page information file. And as with architects, do not forget to add a glossary with terms and definitions to rule out a basic cross field of science misunderstandings.